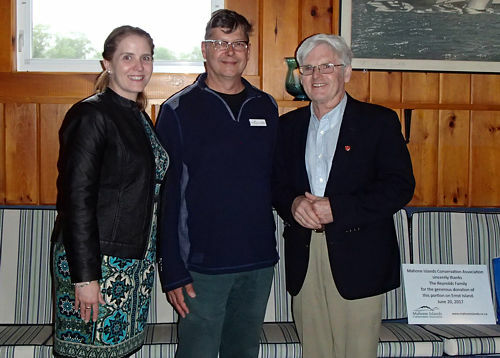 The 'Thank you' reception for MICA Members was held on Tuesday June 20, 2017 at the Lunenburg Yacht Club. This was a small token way for MICA to say thank you and show our appreciation to the many sponsors, donors and volunteers who contributed to the great success of the Gala Dinner and Auction last fall. 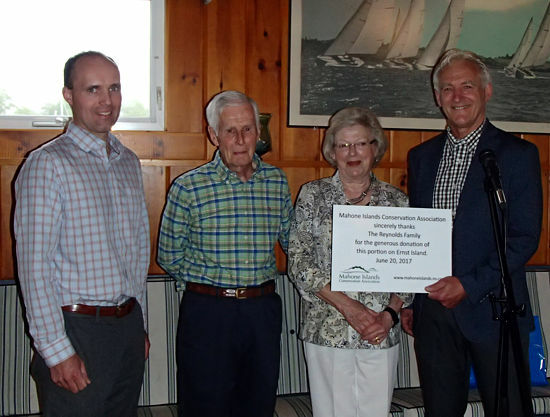 NCC for the recent acquisition of Quaker, Lynch and Snake Islands by NCC with financial support from MICA. The Cluett family for the recent donation of the very nice lot on Zwicker Island. The Court family for the recent donation of the very nice lot on Zwicker Island. Allison and Bob Reynolds for the recent donation of a very significant part of Ernst Island. and John Meisner MICA Chair. expressing our thanks for the recent acquisition of Quaker, Lynch and Snake Islands.